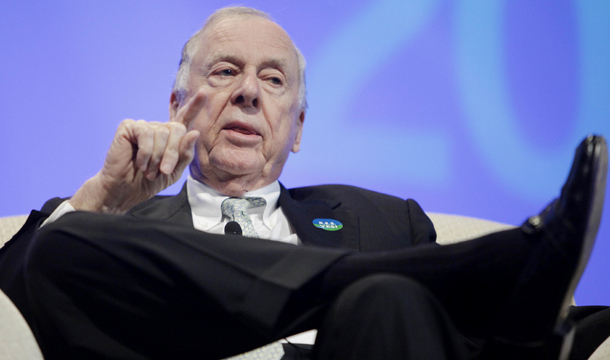 A number of conservative and right-wing organizations and legislators have recently launched public opposition to oilman T. Boone Pickens’s proposal to increase the number of natural-gas-fueled vehicles in the United States. They cloak their opposition to this proposal in economic theory, opposing the program because such subsidies would “distort the competitive process that so capably yields affordable and viable products,” in the Heritage Foundation’s words. At the same time, however, these same institutions and individuals fervently support outdated or unnecessary tax breaks for Big Oil companies even though these subsidies distort the same marketplace. Not surprisingly, these same entities receive significant funding from Big Oil companies. Every president since 1974 put a premium on reducing America’s dependence on oil, particularly from other nations. Former oilman and President George W. Bush went so far as to proclaim that “America is addicted to oil” in his 2006 State of the Union address. Responding to this patriotic call to reduce our oil dependence, longtime Republican donor Pickens developed his “Pickens Plan” in 2008 to dramatically reduce U.S. oil use by fueling vehicles with natural gas. The heart of the plan would create tax incentives for companies to purchase natural-gas-powered medium and heavy trucks, and buses. In addition, it would encourage the construction of refueling infrastructure to provide natural gas to centrally fueled fleet vehicles. The legislation is designed to help jump-start a natural-gas vehicle industry in the United States, which would provide new jobs ranging from design engineers to toolmakers to manufacturers to those who maintain the vehicles. Transportation uses two-thirds of our nation’s oil. About one-third of all oil is consumed by the 8 million heavy-use trucks on our highways. If our nation can switch to a fleet powered by natural gas, of which we have a century’s worth here at home, our dependence on OPEC can be cut significantly. The essential elements of the Pickens Plan were incorporated into the New Alternative Transportation to Give Americans Solutions Act, or the NAT GAS Act, which was introduced by bipartisan groups of senators and representatives in the previous two Congresses. The legislation would jump-start the use of natural-gas-powered heavy-duty trucks by giving tax incentives to purchasers and manufacturers of natural-gas-powered vehicles. The NAT GAS Act is an oil-dependence reduction plan with support from both sides of the aisle. Its politically diverse sponsors are Congressmen John Sullivan (R-OK), Dan Boren (D-OK), John Larson (D-CT), and Kevin Brady (R-TX). The bill, H.R. 1380, was introduced in April with 185 House cosponsors. A bill promoting natural gas vehicles was first introduced in 2008 by archconservative Sen. James Inhofe (R-OK). The first @L&summ2=m&%7C/home/LegislativeData.php?n=BSS;c=111%7C">NAT GAS Act was soon introduced by bipartisan coalition including Senate Majority Leader Harry Reid (D-NV) and conservative champion Tom Coburn (R-OK). There was little conservative opposition to this bipartisan proposal until very recently. Interestingly, most of the conservative opposition to the NAT GAS Act has surfaced only after President Obama publicly supported the Pickens plan. Chief among those who are pushing conservatives in Congress to drop their support for the NAT GAS Act are—not surprisingly—the Koch brothers. Charles Koch has been loudly vocalizing his opposition to the “misguided suggestion that the natural-gas industry should receive enormous new subsidies.” Pickens’ spokesman Jay Rosser noted that the Kochs “have to bet against the plan. They import and refine $2 billion of OPEC oil every year” at Koch Industries’ refinery in Corpus Christi, TX. Despite the obvious contradictions with the company’s public opposition to big government handouts, Koch Industries has lobbied for and received a vast array of subsidies from the federal government over the years. Rep. Mike Pompeo (R-KS), a freshman in Congress who was the top recipient of Koch-related money in the 2010 elections, has been leading the conservative attacks against the NAT GAS Act. Rep. Pompeo maintains that he is opposed to “using taxpayer dollars to support targeted interests within the energy sector” despite his vote to protect billions in federal subsidies for Big Oil. The connection between the $79,500 in campaign funds he collected from the Kochs in the last election cycle and his outspoken opposition to natural gas vehicles seems like more than just a coincidence. The new efforts of right-wing organizations to oppose the NAT GAS Act are paying off, convincing co-sponsors to take the unusual step of publicly withdrawing their support for a bill that they previously cosponsored. Reps. Tim Griffin (R-AR) and Glenn Thompson (R-PA) withdrew their names as sponsors on May 26, joining Reps. Todd Akin (R-MO) and Steve Pearce (R-NM), who dropped their backing earlier in the month. Rep. Thompson had also been a co-sponsor of the @P%7C/home/LegislativeData.php%7C">2009 version of the bill. Despite their new opposition to incentives for natural gas vehicles, the conservative organizations and legislators still defend tax loopholes for Big Oil companies that 74 percent of Americans oppose. Could it be that the organizations that receive millions in Big Oil money are going after support for natural gas vehicles to appease their oil company financers? And that legislators dependent on Big Oil campaign cash are doing the same? And after the Senate’s recent 52-48 vote failed (60 votes needed for passage) to pass S. 940 to cut oil subsidies and reduce the deficit, a Center for American Progress Action Fund analysis found that the 48 senators who sided with Big Oil took in more than $21 million in career oil contributions, while the 52 senators who sided with the American people received just $5.4 million in contributions. That means pro-oil senators received, on average, more than four times as much oil cash as those who voted to end the subsidies. High oil and gasoline prices in 2011 continue to exact a high toll on American families and the economy. They are another reminder—as if one was necessary—that it is imperative to reduce our dependence on this single fuel that powers our transportation system. The NAT GAS Act would make a small investment to reduce the oil burned in trucks and buses, and replace it with domestic natural gas when produced with protection for air, water, and climate. Unfortunately, many conservative organizations and politicians would prefer to keep us hooked on oil, ostensibly to avoid subsidizing one particular fuel. Still, they keep singing Big Oil’s song with their defense of $40 billion in tax subsidies, thereby subsidizing one particular fuel. Even worse than this hypocrisy is that these organizations and legislators would continue handouts to a 20th century dirty technology rather than shifting to a 21st century emerging fuel that the rest of the world is rushing to adopt. There are only 112,000 natural gas vehicles on our roads but 12 million worldwide. This will grow to 50 million in a decade. If conservatives’ efforts to protect Big Oil are successful, it will harm our economy, our competitiveness, our security, and our environment. The chart below lists the organizations and legislators who support Big Oil tax subsidies but oppose investments in natural gas vehicles, their contributions from the oil industry, and their statements in support of Big Oil and against natural gas. “Providing subsidies for every aspect of natural gas-fueled vehicles will only lead to a bloated industry of little help to energy consumers. Washington is no match for the free market when it comes to determining the most promising energy sources.” – Open letter to Congress, May 24, 2011, signed by CEI Senior Fellow Malco Lewis. “Tax incentives like these allow government to decide which energy sources thrive or fail—and thereby distort the market. America’s experience with a number of similar energy subsidies dating back to the 1970s has shown that businesses benefiting from these incentives become reliant on government handouts in order to stay in business, causing the price of the subsidy to rise over time and leaving taxpayers to support industries for decades.” – open letter to Congress, May 23, 2011, signed by 60 Plus Association Chairman Jim Martin. Voted against rolling back taxpayer subsidies for Big Oil on March 1. Voted in favor of the GOP budget, which retained $40 billion in Big Oil tax loopholes on April 15. Voted against legislation to prohibit the Big Five oil companies from receiving tax breaks for domestic manufacturing on May 5. Withdrew co-sponsorship of the NAT GAS Act in May 2011. “I am concerned that H.R. 1380 might be inconsistent with my goal of simplifying the tax code by lowering the overall tax rate and simultaneously ending industry-specific incentives.” Withdrew co-sponsorship of the NAT GAS Act in May 2011. Dan Weiss is a Senior Fellow and Director of Climate Strategy at American Progress. Stewart Boss is an Intern with the Energy team.